As a society, we’re obsessed with a commercial image versus the reality that stares back at us every day. It has been a crappy season. Nothing prepares you for losing a child. In fact, you’re bombarded with hopes and dreams that you didn’t even know existed. Normally, I’m that person that puts their Christmas tree up on November 1st. I plan out a fun advent activity for my little ones. I have already decked the halls to the fullest by November 5th. This year, none of this is the case. My Christmas spirit is wounded, and I am internally battling an unfairness that is teaching me a great deal. I planned for our Christmas baby. Then the dream was ripped away. I’ve cried so many tears. Asked so many questions and deliberated so many what-ifs. It’s been six months, yet I still feel an emptiness. Grief tends to do that, right? It alters everything and leaves an ominous presence. I’ve accepted that this loss is forever grief. Ultimately, there is no end date to my mourning and the probability of losing it on a whim is relatively high. So, as I entered the holiday season I felt guilty because I wanted nothing to do with it. As I took a moment to seriously reflect, I realized that I have the authority to say no. I know what you’re thinking, you’re numbing yourself and choosing to be unhappy. But, the thing is I’m not. I’m choosing quality. I will be a much happier version of myself if I don’t over commit to things that are not going to bring me joy at this time. Not participate in the white elephant gift exchange at work. The reality is no one even cares. Not bake homemade Christmas cookies with my kids. Instead I bought delicious Pepperidge Farm cookies and we celebrated being a family just the same. Not send Christmas cards. I don’t want to force my family to smile for an orchestrated picture and stress myself out with organizing coordinated apparel. Instead, I’ll thank friends and family that send us a card and I’ll hope that loved ones know we wish them well all year long – not just during the holidays. Not prep an extensive advent for my children. Normally, I create an advent which is filled with activities and little items. In the past, during advent, I find myself constantly preaching to my children, to be grateful for their many blessings and not be focused on receiving the little item – whether it is a sticker or notebook. Yet, I am the one purchasing all of the things. Wait to put up our tree. My husband wanted to still make Christmas special, so we opted to cut down our own Christmas tree. 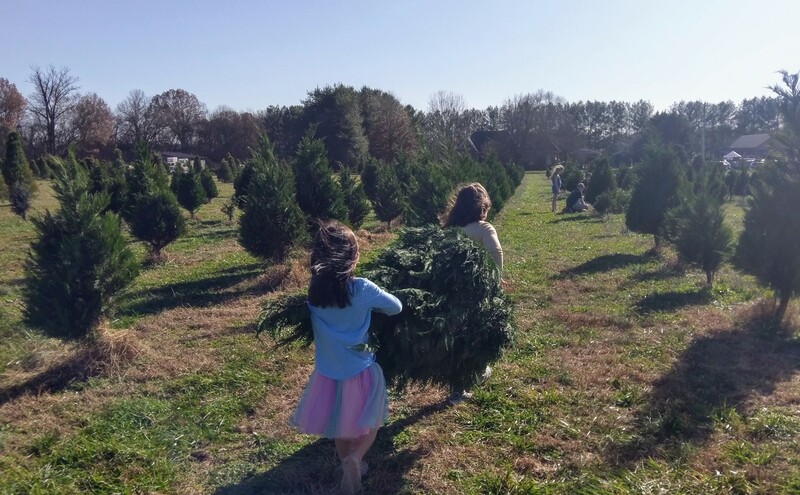 The gesture took the pressure off me, gave me time to process feelings, and gave our kids something to be excited about – their first ‘real’ Christmas tree. I’ve given myself grace this holiday season and I’m relishing in the down time. I desperately need it. Committing to staying indoors and catch up on movies has been a gift. The snuggles with my kids and real conversations with my husband are therapeutic and exactly what I need this holiday season. It’s depressing that a tragic situation oftentimes sobers us up and puts things into perspective. As a society, we’re obsessed with a commercial image versus the reality that stares back at us every day. I am a big fan of words! Helping others through my writings and sharing the words of others is my passion. I also enjoy long walks at Target, iced coffee and naps.